EDUCATION PROCESS The term of study at the University is 6 years. The academic year is divided into 2 semesters: Fall semester: September - January; Spring semester: February - July. Each semester ends the session, during which students take exams in certain disciplines of the corresponding semester. 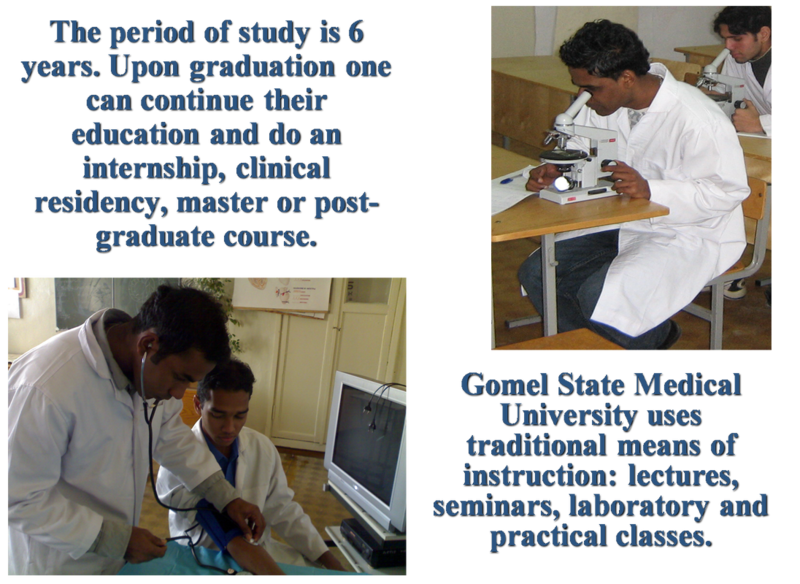 Gomel State Medical University offers traditional forms of learning, which include lectures, seminars, laboratory and practical training. In the course of 1-3 classes are 2, 3, or 4 academic hours (45 minutes each). At the undergraduate subjects in the study of clinical training is organized in the form of cyclic classes (classes 4-6) in the clinics on 5 and 7 hours per day. Education each semester includes a set number of hours in disciplines relevant to the curriculum. Transfer students on the next course is subject to a mandatory surrender of all examinations and tests prescribed curriculum. The transfer of the discipline to another semester or the course is not permitted. Medico-Abroad, is a registered firm (Regd. No.2033 of 2002 with Registrar of Firms, Hyderabad , Andhra Pradesh) engaged in overseas admissions of students from India in educational courses of reputed colleges/universities of Europe, China and Central Asia regions. The firm acts as representatives of various foreign universities for facilitating the admission of students into those Universities and Educational Institutions, and also provides Educational Consultancy and Career guidance to students. An eminent Journalist, renowned Novelist, prolific Writer, successful Industrialist, a distinguished Leader in public life, the Champion of social justice, an Educationalist, Intellectual… Late Shri Vinukonda Nagaraju personified the virtues of an Idol. As the Editor, Publisher and Proprietor of the legendary “Kammendo” magazine, the essays, articles and reviews penned by him on the socio-political issues for more than three and a half decades had sensitized the cross section of readers in Andhra Pradesh, and influenced their participative role in an egalitarian society. To Groom a breed of Doctors Value based, Ethical, Service oriented and with a touch of Humanity and Humility. To reach out to the aspiring students and provide the necessary guidance and support to fulfill their dream to be a Doctor. To create awareness on various aspects involving foreign medical education, clarify the misapprehensions, and promote its spread and acceptance. V.Rajaram, the Managing Partner of the firm is a first class Chemical Engineer with Post Graduate degree from Higher Institute of Chemical Technology, Sofia , Bulgaria . As a research scholar, he presented the thesis on “Alternative building component material – Wood Polymers” and won the best student award of the faculty. He was twice elected General Secretary to the ‘International Foreign Students Social Solidarity Friendship Association’ of Sofia , and had also represented as Bureau member of ‘Foreign Students Welfare Association’ of Bulgaria . DREAMZ LEARNING INNOVATIONS PVT. LTD., the Hyderabad-based company, are the pioneers in revolutionizing the ‘E-learning’ method of study for medical students. They have developed comprehensive study material content based on MCI syllabus for MBBS students and also the preparatory study material of question banks and test series for various PG entrance examinations held in India. Dr.Murali Bharadwaj, the renowned teacher for PG coaching classes has developed the modules, both online and offline, for the Medicos pursuing medicine courses anywhere in the globe to receive the same knowledge resource as students in AIIMS, JIPMER in India. 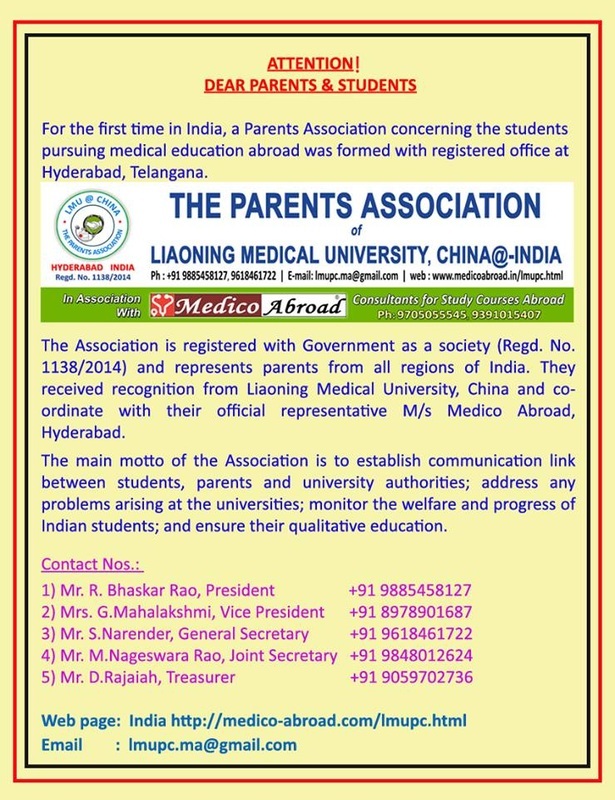 CONTACT DETAILS OF PARENTS ASSOCIATION OF LIAONING MEDICAL UNIVERSITY,CHINA@-INDIA.